The nearly two dozen microphones planted and placed parabolically around ballfields offer Fox Sports A1 Joe Carpenter the equivalent of a symphony orchestra’s worth of sound effects for each game. However, for the recently concluded World Series, which took place at Boston’s Fenway Park and Los Angeles’s Dodger Stadium, Carpenter was working those sources more like a garage band. Less effective were the mics around home plate, during a Series when fewer players and none of the umpires agreed to be wired for sound during play. There, Carpenter relied on parabolic microphones aimed at the plate. But there was still plenty of sound to be mined from the field. For instance, when home-run hitters came back to the dugouts, teammates’ accolades were clear and present, pulled from Cameras 1 and 5 at either end of the dugout and from handheld camera mics in the area. However, network S&P monitors and their “plungers” — buttons that mute the audio — seemed especially active during the games, Carpenter noticed. Mixing crowd sounds requires more finesse than is readily apparent. The fact that crowds numbering in the tens of thousands are made up of individuals becomes painfully clear as soon as a few of them start whistling loudly or banging on metal stanchions, creating piercing transients. Setting this Series apart sonically were the individual quirks of each stadium. Fenway’s antique architecture includes the famous (or infamous, per Bucky Dent in 1978) Green Monster, a metal-covered wall in left field that contributes to what Carpenter describes as some of the oddest acoustics in baseball. On the other hand, Fenway’s antiquated scoreboard, behind which the box score is updated manually by workers hanging numbers printed on green tin tags, offered a roost from which a camera mic was able to pick up the clangs of balls hitting the Monster. Dodger Stadium had its own issues. Though not as ancient as Fenway, it does cling to the kind of point-source PA system, stacked at the back of centerfield, seen more often in college football venues and deploying sheer brute volume to cover the venue. For instance, mixing microphones planted around home plate was tricky to avoid picking up the PA when Carpenter was trying to highlight a bat smacking a batter’s cleats. 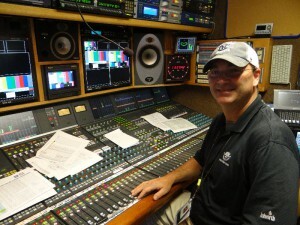 During player introductions before the games, he dialed in nearly a 0.5-second delay on one processor to align the distant PA’s sound to match what was coming through the microphones. 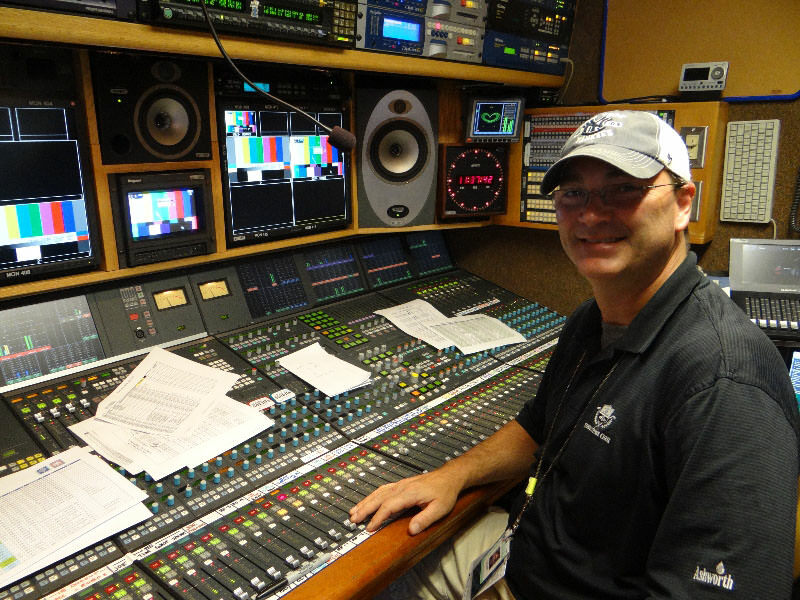 He used a second delay processor with 141 ms of delay for the mics on the RF cameras aimed at performers singing the national anthem, again to align with sound from the PA nearly 400 ft. away. “There’s a lot of math you have to do all day long at Dodger Stadium,” he says. Another kind of math was required in Game 3, at 18 innings the longest in World Series history. Despite the lack of wired-for sound players during the series, though, he feels that the concept has reached an inflection point among players.